The town of Chartres, situated to the southeast of Paris, is dominated by its magnificent and justly famous cathedral dedicated to Mary, the mother of Jesus. This structure is built on the foundations of earlier churches, the first dating to the eighth century. Warfare and fire account for their destruction. When yet another disastrous fire struck shortly before 1200, gutting the cathedral, the bishop and the cathedral clergy decided to rebuild in the "New" or "French Style," that is, the architectural style known today as Gothic. 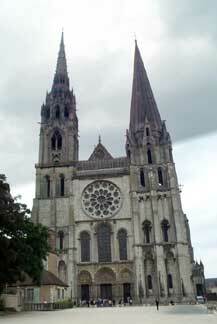 Chartres marks the moment when the gothic cathedral interior was rationalized; for the first time the nave elevation was organized according to the ratio of A:B:A. Simply put, the nave arcade (A) is as tall as the clerestory (A), while the height of the intermediate unit, the triforium (B), a second-storey arcade, is variable. The tripartite (three--part) nave elevation, an instant success, was imitated in all later (French) cathedrals. Lucid and neat, it permitted mason--architects to increasingly raise the height of their cathedrals and make them more luminous and delicate. Despite the many losses suffered by the cathedral at Chartres, some of the most glorious gothic sculpture and colored glass survive intact. The portals (entrance ways) depict dignified prophets, saints, and biblical scenes and even depictions of everyday life, while the gem-like radiance of the glass windows illuminate the vast darkened interior with ethereal rays of ruby red, radiant blue, shimmering green, and sparkling white and yellow. The great circular window set into the west façade --the main or "front" entrance to the cathedral-- is a "rose" window, a symbolic form. The rose, like the lily, was one of many metaphors used by church authors to identify Mary.